Marie-Galante offers a number of trails of varying difficulty, from a simple walk to a six-hour hike. These include a two-hour round-trip hike from Grand-Bourg to Château Murat , via the Mare au Punch and Ducos mill. North of Capesterre, a six-hour round-trip cliff tour to the windmill of Mayoumbé includes the ruins of several sugar plantations, the Grand Bassin and numerous windmills. North of Saint Louis, a three-hour round-trip hike includes Anse Canot, Moustique Beach, Chalet and Merlet mills, the mangrove and Vieux Fort. The island's soft, rolling topography and minimal traffic make bicycling and horseback riding popular activities. Please click here for local land sports options. With its multitude of magnificent white sand beaches, Marie-Galante is a paradise for swimmers and water sports enthusiasts. 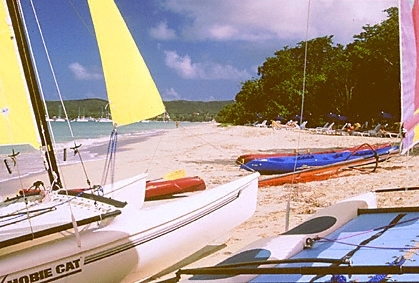 Snorkeling, diving, windsurfing and sailing are all popular with island visitors. Please click here for local water sports options.